Welcome to 2Tickets.ca (hereinafter the "site" or "we"), the #1 site of ticket resale in Quebec! This User Agreement (hereinafter the "Terms") shall form a contract between you (hereinafter designated, depending on the context, as the "user", the "member", the "purchaser" or the "seller") and 2Tickets.ca. These Terms govern your use of the site as well as the services offered by 2Tickets.ca. 2Tickets.ca reserves the right to modify these Terms at all times. Your continued use of the site shall confirm your acceptance to respect these Terms as they are stipulated and modified from time to time. If you cannot comply with these Terms, you shall immediately refrain to use the site and the services provided by 2Tickets.ca. 2Tickets.ca makes available to its users, whether they are purchasers or sellers, a platform allowing them to sell or buy, as the case may be, tickets for all types of events. The transaction takes place between the purchaser and the seller, since 2Tickets.ca acts only as an intermediary between the two. 2Tickets.ca is not the owner of the tickets traded and cannot ensure that the purchaser or the seller will complete the transaction. 2Tickets.ca is not a merchant within the meaning of the consumers protection laws applicable in Quebec. Sellers of tickets on the site declare not being merchants and acknowledge not being covered by the prohibition of ticket resale under Section 236.1 of the Consumer Protection Act. Sellers of tickets on the site declare acting solely on their own behalf, and shall assume all liability arising from their use of said site, at the entire exoneration of 2Tickets.ca. The terms "ticket resale" means any activity where tickets are bought by a person and resold to another. The resale price may differ from the original price written on the ticket. Purchasers of tickets on the site acknowledge that the price paid for their tickets via the site may be higher than the price paid initially by the seller to the promoter of the event. iv) not be temporarily or definitely banned from using the site or the services of 2Tickets.ca. If you do not comply with one of these conditions stipulated above, we ask you to immediately cease to use the site and the services provided by 2Tickets.ca. All users of the site and services provided 2Tickets.ca shall also ensure that they are able to receive emails distributed from the address [email protected]. To sell tickets on our site, each seller must mandatorily open a member’s account. To buy tickets on our site, the opening of a member’s account is optional. (ii) update this information when it changes. 2Tickets.ca is not liable for the fees, delays or any other consequence resulting from any erroneous information provided by the member. Members may choose their preferred payment method of the purchase price of their tickets among those made available to them by 2Tickets.ca. The payment method chosen by the member is used only to receive the sums resulting from the sales. The member agrees to provide information about the payment method that is accurate, truthful and up-to-date. 2Tickets.ca is not liable for the payments lost, due, or of any problem caused by a mistake of the member at the time of the configuration of the payment method. The member agrees to keep the information up-to-date as to the payment method chosen to prevent any mistake or problem while processing the payments to the member. It should be noted that the updating of the payment information shall not affect the transactions made prior to such update and shall not change the payment method indicated for the tickets already registered. If the member wishes to modify the payment method for an ongoing transaction or for tickets already registered, he must absolutely contact beforehand the customer service to do so. Even though this information is stored securely, 2Tickets.ca, in the absence of negligence or gross fault, is not liable in case of identity theft, phishing or any other fraud that can be committed by theft, piracy or extortion of information from its servers. Members must create a password and link it with their email address. Members are responsible to store this information securely and confidentially. Members are responsible for all actions taken from their account. 2Tickets.ca reserves the right to suspend or close any account used inconsistently or fraudulently, or to restrain a member from accessing the site, in whole or in part, and that, without notice, in all cases deemed appropriate by 2Tickets.ca. Suspension or closure of an account cannot give rise to any compensation whatsoever payable by 2Tickets.ca to such member. Each user of the site is solely responsible for transactions made under his account. 2Tickets.ca cannot be held liable for any loss, delay, damage or defect caused by any action, usage or intervention performed by the user or any other person accessing his account. 2Tickets.ca is not required to notify the user in advance of any behaviour or action that may cause any loss, delay, damage or defect. To sell tickets on the site, you must mandatorily complete the Seller Certification. The Seller Certification consists in the verification and validation by us of the credit card that you own and that you have submitted to us, as well as your personal information (surname, name, address, postal code and phone number), with the issuer of the credit card used as a warranty. The information submitted must be truthful and accurate, otherwise it will be impossible to complete the certification. The credit card provided to complete the Seller Certification is also used to support the 100% Guarantee, whether to warranty the sale process or the validity of the tickets. In the event where the tickets do not correspond to the description given by the seller, are false, delivered too late or are otherwise defective, fees and penalties may be charged on this card, as provided under Section 29 hereof. Once the certification is completed, the seller is responsible to update his personal information or the information about the credit card, or the billing address, the event of any change. The certification process shall be completed again to validate, when appropriate, the accuracy of the modifications made. 2Tickets.ca informs you that the processing of your demand for obtaining the Seller Certificate or its update might lead to a temporary deactivation of your account, your inventory or prevent you from performing transactions for a given period of time. You acknowledge that 2Tickets.ca cannot, in any case, be liable for the delays of the Seller Certification and the verification of the information provided. 2Tickets.ca does not charge any fees for members’ registration or for the listing of a ticket ad by the sellers on its site. (ii) offer to the purchaser, at the seller’s expense, where possible, replacement tickets of equal or better quality. (iv) applicable sales taxes (GST and QST). 2Tickets.ca never discloses to the seller information relating to the purchaser’s payment. At the latest ten (10) business days after the date of the event, 2Tickets.ca proceeds to the payment of the seller. The payment is made in accordance with the payment method chosen by the seller at the time of offering the ticket for sale. The seller has to ensure that the particulars related to the payment method chosen beforehand is valid and accurate when 2Tickets.ca sends out the payment. Service fees are kept by 2Tickets.ca from the amount of the payment made by the purchaser, and the balance of the payment will be paid to the seller. (iv) that the tickets are valid from the time of their sale until the event. When offering the tickets for sale on the site, the seller grants the right to 2Tickets.ca to modify, adapt, publish and display on the site, or on the sites of partners, the tickets’ description in order to sell or promote them. Tickets are displayed on the site until a period of fourteen (14) days prior to the event, after which period the tickets will no longer be displayed and can no longer be sold through the site. Notwithstanding the foregoing, 2Tickets.ca and the seller may agree on a display period for the tickets expiring less than fourteen (14) days prior to the event and this, upon the circumstances of each case, including the compliance with the warranties provided by the seller to 2Tickets.ca as well as the proximity of the tickets. Display of the tickets ceases automatically fourteen (14) days prior to the event, or at any other date agreed between 2Tickets.ca and the seller, and the tickets shall no longer be sold through the site. (iv) brochures, price lists or catalogues, business cards, coupons, ads, solicitations or any other promotional material. (iii) keep, reuse, make public or resale the purchaser’s contact information for any purpose other than sending to the purchaser the tickets sold on the site. (iii) deliver the tickets sold as they were described. (v) the beginning date for the sale and the ending date. As well, the seller agrees to guarantee the validity and access to the event and to the seats described. Seller also undertakes to add, through Subsection "Characteristics and Restrictions", in the field "Other", any information which may affect the value, the access or the desirability of the tickets, including, without limiting the foregoing, the following elements: obstructed view, seat reserved for persons with disabilities, parking included and concessions included. (ii) at the time of receiving the tickets, if the tickets offered for sale are not in his possession ("not in hand") at the time of offering them for sale. Seat numbers are not displayed on the site in order to keep the anonymity of the seller. Seller may also, if he wishes, hide the row of the tickets and display it as an interval, and that, in order to strengthen his anonymity. If the seller fails to comply with any provision of this Section 14, he will automatically be subject to the penalty provided under Section 29 hereof. Please note that 2Tickets.ca does not control the accuracy or adequacy of the online ticket listing or of the representations made by the sellers and does not make any representation regarding the tickets offers, including their presentation and their content. Moreover, even if 2Tickets.ca makes all reasonable efforts to ensure the accuracy of the information and documents it publishes itself on its site, the site and its elements are provided "as is" without warranty of any kind, implicit or express, regarding its accuracy, completeness or it being up-to-date. 2Tickets.ca, any corporation, partnership, trust or any other legal entity controlled by or affiliated to it as well as its shareholders, directors, executives, employees, agents and representatives cannot in any case be held liable of any damage related directly or indirectly to the use of the site and/or of its content, whether it has been published by 2Tickets.ca or its members. Seller agrees to deliver the tickets to the purchaser at the dates indicated in the description provided for them. When offering a set of two or more tickets for sale, the seller agrees that these tickets are consecutive (side by side). If it is not the case, the seller agrees to create different sets to represent the fact that these tickets are not consecutive (side by side). Seller acknowledges that the tickets he puts on sale exist, are valid and belong to him. Seller acknowledges that it is strictly forbidden to put on sale non existing tickets, invalid tickets and/or tickets he does not own. Therefore, 2Tickets.ca strongly suggests to the seller not to display his tickets elsewhere than on his site. If, however, the seller does not respect this rule, he agrees to immediately withdraw from the site tickets sold on another platform or by another mean than through the site of 2Tickets.ca. This rule will prevent a purchaser from purchasing tickets that are no longer available from a seller on the site. In such a case, the seller would still be contractually liable to deliver the tickets to the purchaser, or shall be subject to the applicable penalty, as calculated under Section 29 hereof. If a defect is identified by the purchaser, the latter is required to communicate directly with 2Tickets.ca within ten (10) business days following the receipt of the tickets, as set forth in Section 28 hereof. 2Tickets.ca does not control or approve transactions made through the site and users are solely responsible for the legality of their actions. 2Tickets.ca shall not incur any liability in case of a failure or counterfeit of tickets put for sale on the site and makes no warranty with this respect. Users are solely responsible for ensuring that the tickets concerned are valid and that they can sell or buy them under applicable laws. Seller acknowledges that, for some events, it is forbidden to put tickets for sale before the official sale organised by the promoter of the event. In such case, the seller will receive a notice upon offering his tickets for sale which will inform him of this fact and a note will appear automatically in his inventory as well as on the page of details related to the tickets. Tickets will become automatically available for immediate purchase on the first day of the official sale of tickets organized by the promoter of the event. (ii) by clicking on the link "Problem" from the section "Sales to Confirm". is subject to the resolution of the sale and must pay the replacement costs or penalties associated with, per the provisions of Section 29hereof. When he has the tickets in his possession ("in hand"), the seller agrees, within 48 hours following the sale of his tickets, to confirm the sale, by clicking on the button "Complete the Sale", from the email of confirmation received, or by clicking on the button "Confirm!" associated with the tickets sold, from the page "Sales to Confirm" of the site. Seller agrees, within 24 hours following the confirmation of the sale, to print the shipping label (where applicable), to prepare an envelope for the shipping of the tickets and to deposit it in a Canada Post office or a service counter of FedEX, in accordance with the option indicated on the site. When he does not have the tickets in his possession ("not in hand"), at the time of sale, the seller agrees, within 48 hours from the date which he has specified that he will have the tickets at hand, to confirm the sale, by clicking on the button "Complete the Sale", from the email of confirmation that will have been sent to him, or by clicking on the button "Confirm!" associated with the tickets sold, from the page "Sales to Confirm" of the site. Seller agrees, within 24 hours following the confirmation of the sale, to print the shipping label (where applicable), to prepare an envelop for the shipping of the tickets and to deposit it in a Canada Post office or a service counter of FedEX, in accordance with the option indicated on the site. The seller agrees that tickets sold to the purchaser strictly comply with the information declared about them on the site. If the seller cannot sell to the purchaser tickets which strictly comply with the information declared on the site, the seller agrees to report this problem to 2Tickets.ca and to propose to the purchaser replacement tickets of equal or better quality. The purchaser may then accept or refuse the replacement tickets offered by the seller. In case of refusal from the purchaser of the replacement tickets offered by the seller and when it is impossible for the seller to offer other seats in replacement which would satisfy the purchaser, 2Tickets.ca reserves the right, in its sole discretion, to impose a penalty to the defaulting seller, as calculated under Section 29 hereof. The sale may also be resolved without judicial proceedings, with full refund to the purchaser and 2Tickets.ca of the amounts collected. In the case of cancellation of an event for which tickets were sold on the site, 2Tickets.ca will proceed with the resolution of the sale, and the sale will then be found under the section "Cancelled" of the section "Sales" of the site. 2Tickets.ca will communicate in the best delays with the purchaser to warn him of the cancellation of the sale and the purchaser will be fully reimbursed for all fees paid, with the exception of shipping fees. In the event where the sale has not been completed and that the payment has not been paid, the seller will not be paid. However, if the sale has been completed and the payment received, the total amount of the sale, including the service fees and applicable taxes, will be charged on the credit card that was used for his certification, to guarantee the validity of the tickets. If the event is cancelled and tickets are left unsold, 2Tickets.ca will proceed to the cancellation of such tickets for sale and they will be found under the section "Cancelled" of the seller’s account. No fees will be charged to the seller for offering for sale the tickets which thereafter were cancelled. If the seller is informed of the cancellation of the event for which he is selling his tickets on the site, the seller shall inform 2Tickets.ca promptly and remove the tickets offered from the site. In case of postponement of an event for which tickets were sold on the site, the sale concluded between the purchaser and the seller will still be valid, as well as the commitments and responsibilities of each party. Tickets will then be moved to the section "Tickets Pending for Problem Resolution" of the page "Waiting for Confirmation" in the sales section of the site. If new tickets are issued by the promoter of the event, the seller agrees to ship them to the purchaser upon receipt. 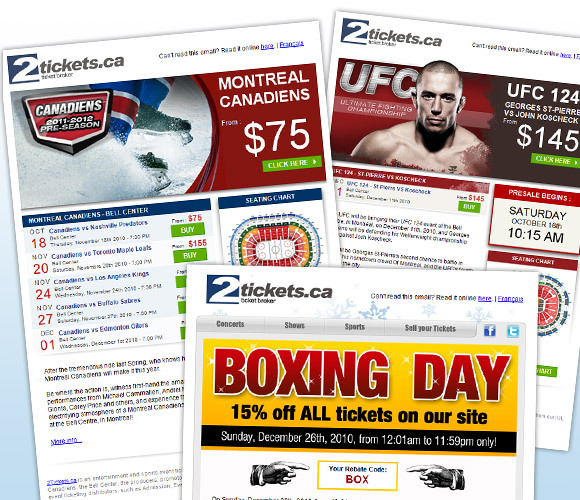 2Tickets.ca allows the sale of electronic tickets on its site. Sellers must comply with the conditions that apply to the sale of regular hard tickets. Seller agrees at all times to comply with the instructions issued by 2Tickets.ca as well as the deadlines it imposes. If seller fails to follow these instructions and deadlines and that, as a result, it prevents the delivery of the tickets to the purchaser on time for the event, or that it delays problematically the sale or delivery of the tickets to the purchaser, 2Tickets.ca reserves the right to impose to the seller at its sole discretion, a penalty, as calculated under Section 29 hereof. Purchaser agrees to proceed all transactions on the site with a credit card of which he is the owner of for which he is legally allowed to proceed a transaction. In order to ensure the legitimacy of the credit card used and to limit frauds that may be made on the site, 2Tickets.ca allows tickets delivery only to the address confirmed by the purchaser’s credit card issuer. Purchaser who confirms an order by clicking on the button "Continue" of step two of the purchase process, or who concludes a purchase by phone, becomes at that time party to a contract with the seller for the purchase of the tickets selected. At that time, the purchaser allows 2Tickets.ca to obtain a preauthorization of the credit card issuer which has been provided to make the order. This preauthorization represents the amount including the total cost of the tickets (including service fees), shipping fees and applicable taxes. Within 48 hours following the sale, the amount preauthorized will be charged to the purchaser and this amount will be paid to the seller according to the terms indicated under Section 10 hereof. 2Tickets.ca is not liable for the additional fees and penalties that can be charged by the credit card issuer to the card owner. Purchaser has ten (10) business days from the date on which he receives the tickets to declare himself satisfied or to report any dissatisfaction to the customer service of 2Tickets.ca and use the protection offered by the 100% Guarantee. The 100% Guarantee consists in a guarantee of the authenticity of the tickets sold and their reception by the purchaser on time for the event. 3) purchaser shall, (i) if he cannot assist to the event due to the seller’s fault or (ii) if his view has been substantially obstructed during the event, such as confirmed in this case by the promoter of the event, contact 2Tickets.ca within two (2) business days following the date of the event in order to report one problem or the other, by filling and submitting a claim form to 2Tickets.ca, with the original tickets subject to the claim, otherwise his request will be rejected. 2Tickets.ca shall then, only to the extent that the purchaser proves, in the reasonable opinion of 2Tickets.ca, the veracity of his claim, reimburse the cost of the tickets purchased by the purchaser, including service fees associated with such tickets. 2Tickets.ca reserves the right to refuse any claim that it deems fraudulent, incomplete or unjustified or if the application is filed beyond the deadlines stipulated herein. 4) the applicable sales taxes (GST and QST). This penalty is payable by the seller directly from the credit card provided to complete the transaction on the site, which is hereby expressly consented by the seller. If the credit card provided cannot be charged under this means, the seller agrees to pay the penalty imposed by 2Tickets.ca by any other payment method that will be indicated to him. The seller acknowledges and agrees that 2Tickets.ca may operate compensation of the penalty with any other sum payable to him hereunder. 2Tickets.ca reserves the right at all times to investigate on the infringement of any provision of these Terms. Every user of the site agrees to collaborate fully in case of any kind of investigation. Every user may be asked to provide any information to 2Tickets.ca, including, without limiting the foregoing, the information proving his right to possess a ticket, its source, the acquisition of this ticket and the price paid for the ticket. (v) to refuse access to the site or services of 2Tickets.ca and its partners. If 2Tickets.ca has formal evidence or a reasonable doubt that allows it to believe that the sales made by a seller are illegal or that they infringe the User Agreement of the site or of its services, the defaulting seller accepts that 2Tickets.ca may, at its sole discretion, decide to suspend, delay or refuse to pay the amounts due to him. In the case where a seller is suspended temporarily or permanently, the latter acknowledges that the sales concluded or under completion, as well as the sets of tickets put for sale may be cancelled or removed from the site by 2Tickets.ca, without any prior warning. In the case where a purchaser is suspended temporarily or permanently, the latter acknowledges that the purchases he has made may be cancelled by 2Tickets.ca, without any prior warning. Any user of the site accepts that 2Tickets.ca may report to the law enforcement authorities or to any other party that may be concerned, any activity that might infringe the law. In such cases, 2Tickets.ca agrees to cooperate with the authorities concerned to ensure that the offenders will be prosecuted and punished in accordance with the applicable laws. (f) if you resell, invalidate or modify the tickets of an event postponed. If you owe 2Tickets.ca a sum of money, you hereby authorize 2Tickets.ca to retain your payment, to charge the fees due to it or to charge any other reasonable fee caused by your conduct, including, without limiting the foregoing: late delivery fees, reprint fees, fees due to diversion of a shipment, fees incurred by the replacement of tickets as well as damages equivalent to discounts, gift certificates, reimbursements or any other fee to compensate the purchaser or the seller for his bad experience. You also grant the right to 2Tickets.ca to deduct any amount you owe it from the amount due to you as a seller. The closing of an account, the opening of a new account or the use of multiple accounts do not release you from any liability towards us. We may combine the amounts due by multiple accounts under the name of the same owner. When they use the site, the users may be asked to provide to 2Tickets.ca some material (for example photos, descriptions, etc.) which may be protected by the laws concerning intellectual property. In this regard, the users grant to 2Tickets.ca the authorization to reproduce, display, publish, distribute, edit and modify all material submitted. These authorizations are provided for the entire world, without any remuneration and for an unlimited period, for the purposes of administrating the site and the transactions or for any other purpose related to the activities of 2Tickets.ca. Furthermore, users guarantee to possess or to have obtained all rights or all necessary authorizations for the use of the material under the terms provided herein and that they do not infringe any law or any right of a third party. Users acknowledge that 2Tickets.ca is only a passive intermediary in displaying material online, and that consequently, 2Tickets.ca assumes no liability for the use and dissemination of the material submitted. The content of the site is protected by the Copyright Act and the Trade-marks Act of Canada, as well as by all applicable international conventions. Unless otherwise stated on the site or herein, it is forbidden to copy, reproduce, distribute, publish, translate, download, upload, display or transmit in any manner whatsoever, any element of this site, including, but not limited to, the content, the data, texts, images, codes and software, without prior written from 2Tickets.ca. However, it is possible to display, keep in memory, download or print any content of the site, but only for personal use and as long as it is not modified. "2Tickets.ca" is a trade-mark of 2Tickets.ca Ticket Market Place. Other marks, names, words, logos and drawings may also constitute trade-marks belonging to 2Tickets.ca, other affiliates or a third party. It is strictly forbidden to use trade-marks and commercial names from the site other than as authorized herein or with the written consent of 2Tickets.ca. The users also acknowledge that all intellectual property of 2Tickets.ca is its unique property and no provision of this agreement shall grant to the users a right to use it. The users hereby waive their right to contest the validity of any intellectual property belonging to 2Tickets.ca. Sellers assume all liability and hereby agree to indemnify, defend and hold harmless the ticket purchasers via the site, as well as 2Tickets.ca, its officers, directors, affiliates, employees, subcontractors and agents of any claim, action, cost, fee, judgment, obligation, loss, penalty, disbursement (including but without restriction, legal fees and disbursements) and damages of any kind whatsoever which may be imposed to, incurred by or claimed by ticket purchasers via the site or 2Tickets.ca following the use made by the purchasers or any third party of the tickets sold through the site. Within the limits of what is provided in the section "Limitations of Liability" hereinafter, 2Tickets.ca will assume any and all liability and hereby agrees to indemnify, defend and hold users harmless of any claim, action, cost, fee, judgment, obligation, loss, penalty, disbursement (including but without restriction, legal fees and disbursements) and damages of any kind whatsoever which may be imposed to, incurred by or claimed by the users following gross negligence or a deliberate or gross fault of 2Tickets.ca. Unless there is gross negligence or deliberate or gross fault, the users release 2Tickets.ca, any corporation, partnership, trust or other legal entity controlled by or related to it as well as their shareholders, officers, directors, employees, agents and/or subcontractors of all liability in the event of litigation between the users or of reclamation, as well as for any damage resulting from the purchase or use of tickets via the site or use of the services of 2Tickets.ca, including all loss of benefits, turnover or opportunity. The maximum liability of 2Tickets.ca, its affiliates and/or other corporate entities including its officers, directors, employees, agents and/or subcontractors regarding their liability herein, being extracontractual (including strict liability or negligence), contractual or other regarding any claim related to the offer of services, shall not exceed the amount paid by the user to 2Tickets.ca for the cost of the tickets, including service fees, shipping fees and applicable taxes, giving rise to any such claim. 2Tickets.ca in no way guarantees that the site is accessible or functional without interruption and that its content is free of any error, defect, harmful element or other materially damaging component. 2Tickets.ca, any corporation, company, trust or other legal entity controlled by or related to it as well as their shareholders, officers, directors, employees, agents and representatives waive all liability relating to the malfunctioning of any computer component, any software or any communication line, regarding the loss or absence of network communication or with respect to any failed, incomplete or incomprehensible transmission or any transmission erased by any computer or network and which may limit the ability for anyone to access the site or prevent it. 2Tickets.ca, any corporation, partnership, trust or other legal entity controlled by or related to it as well as their shareholders, officers, directors, employees, agents and subcontractors also waive all liability for any damage or loss that may be caused directly or indirectly, in whole or in part, by the downloading of any Internet page or any software and by the transmission of any information related to the browsing on the site. Each user agrees not to collect, use, and process or disclose personal information, to which they may have access, about other users, for any purpose other than the execution of the transaction concerned. The laws of the province of Quebec and of Canada apply to the use of this site regardless of your place of residence or location. You hereby agree and submit yourself to the exclusive jurisdiction of the courts of Quebec, district of Montreal, regarding any litigation concerning the access and use of this site. Our site may include links to other websites or to services independent from our site. These links or proposed services are provided by courtesy. 2Tickets.ca is not liable for the content of these sites or the proposed services and does not endorse them. 2Tickets.ca cannot be held liable of damages of any kind whatsoever, arising from the browsing and use of these sites or from the use of these services. If you have questions or problems regarding the operation of the site or the process to put your ad online, please do not hesitate to contact us by sending us a message at [email protected] or by clicking here.